The Karl G. Jansky Very Large Array (VLA) is a radio astronomy observatory located on the Plains of San Agustin, between the towns of Magdalena and Datil, some 50 miles (80 km) west of Socorro, New Mexico. 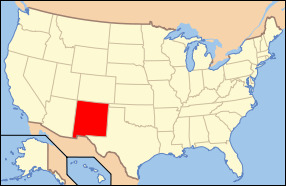 The state of New Mexico is located in the southwestern area of the United States and is typically considered to be one of the Mountain States. The state is the 5th ranked most extensive state in the country covering roughly 121,589 square miles of land area, and it is also the 36th ranked most populated state with a population of 2.08 million as of 2011. In the early times, the land where New Mexico presently sites was inhabited by many Native American people such as the Navajo and the Pueblo. The demographics of the state is largely made up of a strong Native American and Hispanic culture. The capital of New Mexico is the city of Santa Fe, but the largest city in the state is Albuquerque. The overall geography and the landscape in the state consists of anything from wide rose colored deserts to mesas and on to snow covered mountain peaks. The state is largely known as arid, however most of the land in the state is covered by heavily forested mountain wilderness type landscape. Millions of acres of land in the state are protected by the U.S. Government along with several national forests. The overall climate in the state is typically semi-arid although there are some regions experiencing continental and alpine type climates. The major industries in New Mexico primarily include mining (particularly copper, silver, uranium, and potash), natural gas, oil, and tourism. There are a handful of major bodies of water in the state such as the Rio Grande River, Pecos River, Conchas Lake, Navajo Reservoir, and Elephant Butte Reservoir. The highest point of elevation in the state is Wheeler Park which peaks at 13,161 feet above sea level, while the lowest point is Red Bluff Lake which still sits 2,817 feet above sea level. The state nickname is “Land of Enchantment” while the state motto is “Crescit eundo” - It grows as it goes. The state bird is the Roadrunner, the state fish is the New Mexico Cutthroat Trout, the state flower is the Yucca, the state tree is the Pinon Tree, and the state grass is Blue Gramma Grass. New Mexico's large area contains many unique and scenic geographical features along with a strong economy due to its specialized industries, and thus makes it another thriving state in the country. New Mexico is mostly covered by mountains, high plains, and desert.